Your application deadline is quickly approaching! Be sure to monitor the status of your application materials in the online application status check. What if all of your application materials are not received by January 5? Please update Keri Ledezma on the status of your outstanding application materials. If your file is not complete by the application deadline or very shortly thereafter, we will do what we can to include your file in the first round of admissions decisions; however, if your application materials arrive too late, we cannot guarantee it. As a result, make every attempt to complete your application as close to the application deadline as possible. If your TOEFL/IELTS or GMAT scores are not posted to your application record by January 5, please update Keri Ledezma with the date of your test and a copy of the score report, if possible. Your application will not be considered complete and reviewed for a decision until all application materials, including the official score reports, have been received. On average, it takes at least 3-4 weeks for the test scores to be sent, received, and uploaded to an applicant’s record. 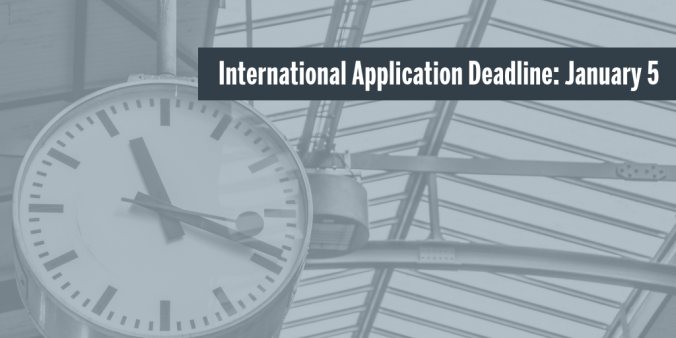 Reminder: All international applications will be reviewed after the January 5 application deadline, not on a rolling basis.